Be aware that phase one has already been implemented, with the new standards requiring a consumer’s name, address, SSN and date of birth to be on all civil judgement and tax lien data. Experian® projected in their preliminary analysis that about 96% of civil judgement data and up to 50% of tax lien data will not meet the new standards. Prior to the effective date of phase one, TransUnion® released a whitepaper that only stated that there was “significant change” to civil judgement data and a minimum of 60% of tax lien public record data will be removed. 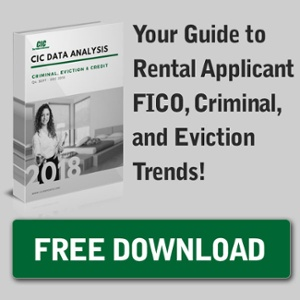 You’ll want to rely on a tenant screening service like CIC™ to provide eviction data, as the presence of a civil judgement record (like a monetary eviction) is no longer reflected within the credit score.